- Mix five tablespoons of miso paste with two tablespoons of vinegar, two tablespoons of water, and four teaspoons of sugar. - Peel the eggplants and cut into cubes. - Coat a large shallow baking pan with oil, and arrange the eggplants in it. Broil till they start to soften (about 10-15 minutes; check their consistency with a knife or toothpick - it should easily go in). - Brush the mix from the first step over the eggplants, and broil for another four minutes. 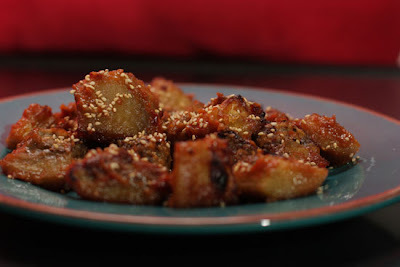 - Turn the eggplant cubes around, brush again with the mix, and broil for another four minutes (or until it turns golden-brown and is ready to be served). - Sprinkle sesame seeds and serve on a nice plate (a blue or green plate adds some color to the yellow/red of the dish).